Tennessee Chiropractic Association | Move it or lose it! With technology now constantly tracking a person’s daily activities, more and more people are celebrating what used to be seen as mundane accomplishments, like reaching their step goal. While there are still those who feel they have to clock in a big calorie burn for it to be beneficial overall; research, however, is finding that even small amounts of activity can have beneficial effects on health. One such study, published in the Journal of the American Geriatrics Society October 2017 issue, evaluated women aged 65 and older. Participants enrolled in the Women’s Health Initiative Clinical Trials and were seen in over 40 clinical centers across the US. Researchers used gait speed, timed chair stand and grip strength to measure physical performance. The women also reported their physical activity levels. After obtaining baseline measures, the women wore a measuring device called an accelerometer on their hip for seven days while going about their daily activities and researchers followed up with the women at 1 year, 3 years and 6 years with 6,000 women participating. As one might expect, the results revealed that the women who had remained physically active had stayed stronger and more fit over the course of the 6 years. Additionally, there were dose-response associations between the physical activity levels and improvements in physical performance. The more active one was, the greater the benefit they received. The study showed that just 30 minutes of light physical activity daily could lower mortality risk by 12%. For those who were able to add an extra 30 minutes of moderate activity, the mortality risk was reduced by as much as 39%. According to the Centers for Disease Control (CDC) public health guidelines, it is recommended that adults have 150 minutes of moderate to vigorous physical activity each week. They suggest older adults follow this same guideline up to the limitations of their personal health. Surprisingly, though, this study demonstrated that even light physical activity below the recommended guidelines could still provide health benefits. Women should note that maintaining high levels of physical activity is associated with improved lower extremity function. This allows for better mobility, fewer falls and generally helps women preserve functional status as they age. These benefits were not only found in the 65-70 year old participants who were in fairly good health. The benefits were seen across the board in all subgroups, regardless of racial/ethnic background, weight, level of functional ability and age. 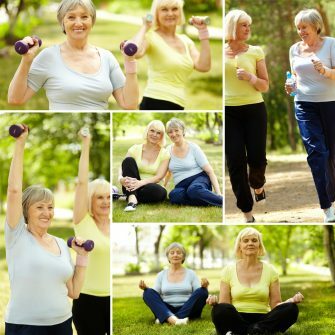 Researchers concluded that regular physical activity plays an important role in maintaining function as we age. Make time for exercise each week, but don’t underestimate the impact of simple daily activities. If you have health concerns about starting an exercise program, talk to your doctor of chiropractic about what activities may be most appropriate for your specific health status. You can also ask about injury prevention for your chosen activity. As the saying goes, “If you don’t move it, you lose it.” Find what makes you move and keep at it. It’s better to start slow and continue, then to never start at all.